I've kind of lost track of how long I've been working on this painting. It's done (I think). All artists have their own personal creative process. Someone asked my a while back how I came up with the idea for this painting. Good question! I took quite a few snapshots of reeds and reflections during a camping trip way last February. I did a painting using one of the shots I found interesting (Reed Calligraphy I, see previous blog). I had a whole series of additional photographs and set them aside, unsure of what to do with them and moved on to another project. Then, I really really felt like painting and realized I'd let myself run out of canvas, stretchers and panels. I panicked. I rooted around in my storage closet. There were 4 long skinny masonite boards, scraps left over from other projects. You know, those things you keep just in case they might come in handy some day. I pondered how I could use them. I cut apart a bunch of the reed photos into strips. Hmmm. The beginning of an idea was forming. I scrounged around again, and found an old abandoned stretcher without canvas. It was the perfect size for the 4 boards, leaving a little space between each. I nailed them onto the stretcher. I applied coats of gesso to prepare the surfaces. Making 4 long skinny paintings didn't seem like it would work. So I decided to divide each panel in half, making a total of 8 images. In order to separate the images on each board, I made a border around each one. I added texture to the borders to separate them even further from each other. 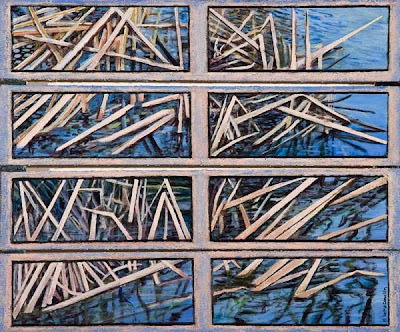 That gave me the idea of contrasting the smooth, shiny water with the rough texture of the borders and the matte of the reeds. I played around with organizing the photos until I felt like the sequence made sense visually. Voila. I started the painting as soon as the boards were nailed onto the frame and gessoed. The ideas developed as I worked. It would have saved time if I have planned the whole thing out from the beginning of the process, but apparently that just isn't the way I work. Does the painting work? I don't know. Sure would love to have someone click on the comment button and tell me what they think. I love that painting Barbara, and reading about it and the changes you've made in your lifestyle too! Best wishes from the North Carolina mountains.